California Gov. 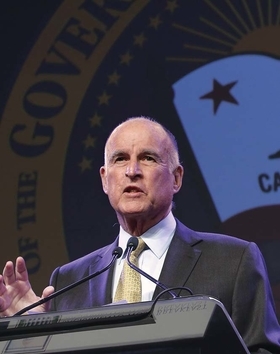 Jerry Brown trimmed the state's proposed budget for fiscal 2017 after projecting a decrease in tax revenue for the coming year, but he awarded more money for value-based payment initiatives and behavioral health programs. Although there were modest increases in funding for Medi-Cal, the state's Medicaid program, patient advocates said the revisions do little to restore $15 billion in cuts made during the recession. The revisions tighten general fund spending to $122.2 billion, down from January's proposed $122.6 billion. The state Health and Human Services Agency took a cut of $747 million and now will receive $33 billion from the general fund. The revised budget also includes $2.2 billion in federal funding for California's Section 1115 Waiver, which allows the state to move forward with initiatives to implement value-based payment models. It also provides another $86.4 million for behavioral health services. Medi-Cal is assuming responsibility for those services from the state Developmental Services department. Medicaid expansion in the state has put more than a third of residents on Medi-Cal. The federal government will begin to dial back its own cost-sharing, picking up only 90% of the tab in fiscal 2021 compared with 95% next fiscal year. Medi-Cal payment rates are among the lowest for Medicaid in the country, according to the Kaiser Family Foundation. The California Hospital Association and patient advocates have been lobbying to reverse rate cuts that went into effect in 2011, trimming most services by 10%.